Incoming first-year students who feel a connection to their school during orientation are more likely to stay enrolled at their institution, particularly students from ethnic minority groups. Those are the findings of a study published last year by the Journal of Vocational Behavior. As the first official introduction to college life, orientation can be an effective way to engage new students, acclimate them to campus, and acquaint them with resources and services that will allow them to hit the ground running — and ultimately graduate. First-year retention rates have not improved over the past decade — and they’re even worse for low-income, first-generation and minority students. According to the National Student Clearinghouse First-Year Persistence and Retention report, just 61 percent of students who started college in the fall of 2015 returned for their second year in 2016. By expanding orientation programs to include other resources on campus that can provide assistance, colleges and universities can help reduce attrition rates among freshmen and new students. Several colleges, like the University of Connecticut (UConn), don’t limit the student experience to a single event. To ensure students receive the guidance and support they need to succeed, UConn holds a Husky Week of Welcome when students move onto campus. New students can also take a First Year Experience course that expands orientation throughout the semester. 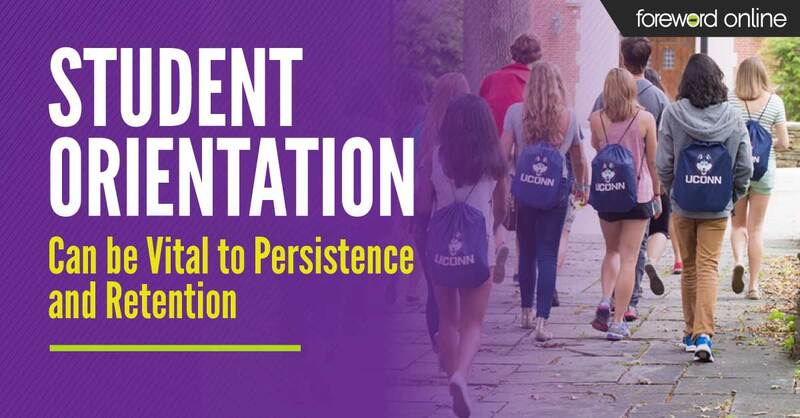 These additional events allow UConn to focus their two-day summer orientation program on introducing students to campus and passing along essential information. For incoming UConn freshman, there is a mandatory two-day orientation program that prepares students for their first year by introducing them to campus life, helping them register for classes, meeting with their advisors, getting their campus ID cards and meeting fellow class members. Beyond textbooks and affordability, the college store has an opportunity to introduce itself as an additional campus resource. By partnering with the orientation program and hosting the resource fair, students start school seeing the bookstore as more than just a place to buy textbooks — it is a community space designed for them. “During orientation, we talk about the other services offered here in the bookstore, including our licensed Starbucks, the UConn Bookstore TechShop, computer repair and a community space. We also let them know the type of merchandise that we sell, including dorm supplies, school supplies and of course, all the great gear that creates campus spirit,” Oser says.